One visit to Australia will leave you wanting more. 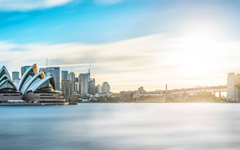 From the sophistication of Sydney to the unhewn beauty of the Outback, you'll have an amazing time that will leave your camera full of pictures and your mind full of memories. Australia was uninhabited until stone-culture peoples arrived, perhaps by boat across the waters separating the island from the Indonesia archipelago more than 40,000 years ago. Portuguese, Spanish, Dutch, and English explorers observed the island before 1770, when Captain Cook explored the east coast and claimed it for Great Britain. (Three American colonists were crew members aboard Cook's ship, the Endeavour).